Builds and executes a single Map Algebra expression using Python syntax. The Raster Calculator tool is intended for use in the application only as a GP tool dialog box or in ModelBuilder. It is not intended for use in scripting and is not available in the ArcPy Spatial Analyst module. 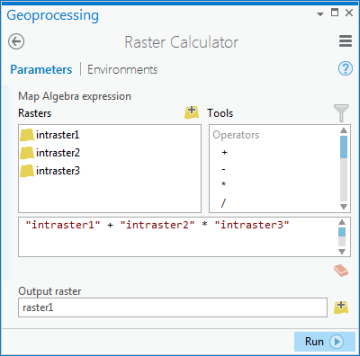 The Raster Calculator tool allows you to create and execute a Map Algebra expression that will output a raster. Use the Rasters list to select the datasets and variables to use in the expression. The Tools list provides a selection of commonly used conditional and mathematical tools, allowing you to easily add them to the expression. Numerical values (and mathematical operator symbols) can be added to the expression directlly. Full paths to data or data existing in the specified current workspace environment setting can be entered in quotes (""). Numbers and scalars can be directly entered into an expression. Multiple geoprocessing tools and operations can be combined in a map algebra expression using standard Python syntax. When typing tool names, be sure to check the tool name syntax. If the capitalization is incorrect, the expression will be invalid and fail to execute because Python is case sensitive. You do not need to put the output raster name or the = sign in the expression because the output name is specified in the Output raster parameter. You can easily clip a raster dataset by setting the extent environment and specifying the input raster name in the expression. When the tool is executed, the resulting raster output will be clipped based on the specified extent. To create a raster with cells of a constant value, specify the appropriate extent and cell size environment settings and enter the numerical value into the expression. The performance of an operation may be enhanced by the deferred evaluation capabilities of Map Algebra. Deferred evaluation is an optimization technique where individual components of an expression are intelligently processed so as to minimize the creation of intermediate datasets on disk. Only operators and tools that process on a per-cell basis can take advantage of this capability. Operators and tools that support deferred evaluation are included on the raster calculator tool itself either as a button or in the list of tools provided. Layer names will be enclosed in double-quote symbols (""). Long, double, or Boolean-type variables will be enclosed in percent symbols (%%). They do not need to be in quotes. Variables representing dataset names or strings should be enclosed in both quotes and percent symbols ("%%"). For example, inraster when selected from the variable list will become "%inraster%" in the expression. Variables are connected to the Raster Calculator tool when they are selected from the list of variables. All variables are automatically listed in the Variable list inside the tool. When a dataset or variable is used in the expression, a link between the variable and the tool will be created. If you remove the variable from the expression, the associated link between the variable and the tool will also be removed. If you delete the connection to a variable, the variable is not removed from the expression. You should not rename a variable that is connected to the tool, since the variable will not be renamed within the expression. If you do so, the expression will be invalid. Certain Raster storage environments may apply to this tool when output is in a raster format other than Esri Grid. For the Raster Statistics environments, only the Calculate Statistics check box is supported. For the Compression environments, only the type of Compression is supported. This environment will only apply when the output would be of integer type. Compression is not supported on floating point rasters, so this environment will only apply when the output would be of integer type. The Tile Size environment is only supported for raster output in the following formats: TIFF, file geodatabase, or enterprise geodatabase. In Python, Map Algebra expressions should be created and executed with the Spatial Analyst module, which is an extension of the ArcPy Python site package. See Creating output from Map Algebra for information on producing output from Map Algebra expressions in Python.